Brian H Waters: Does Not Wrestling in a WWE Ring, Keep Sting From Being an Icon? Does Not Wrestling in a WWE Ring, Keep Sting From Being an Icon? On the March 19th episode of Perfect Plex Talk Radio, Mike Knoxxx and The Shark Sean Williams participated in a friendly debate on whether or not Sting should be considered an icon since he has never wrestled in a WWE ring. Knoxxx brought the point up after stating that WWE Hall of Famer Road Warrior Animal indicated that you cannot be considered an icon in this business if you never worked for the WWE. Knoxxx agreed, while The Shark stated that Sting should be considered icon worthy. Since I was unavailable to chime in due to illness, allow me to voice my opinion. In order to be considered an icon there are a lot of things that must be taken in consideration. Sting was WCW when Ric Flair had left the company. Many had considered him their Hulk Hogan. When Flair was there, Sting was the top face, and Flair was the top heel. When the NWO ran over everyone, it was Sting who every looked for to save the company. Sure at Starrcade 1997, Bret Hart has just arrived but in order for things to make sense, they had to give the title to Sting. When WCW shut down, it was Sting and Flair who closed the curtains. Now what would have happened if Vince McMahon would have discovered Sting? Many argue that no one would have known who Hulk Hogan was. In my opinion that is false. But lets place Sting is his former tag team partner's shoes, the Ultimate Warrior. It is WrestleMania VI, and the main event is Sting vs Hulk Hogan. Not only is the match great, but Sting goes over, Hogan get his break, and the locker room is a lot happy because they enjoy working with Sting. Even if Hogan comes back in 1991 to reclaim the title, Sting and Hogan can work together on many occasions, and McMahon can be happy and does not have to use the phrase, "I could not wait to fire him." 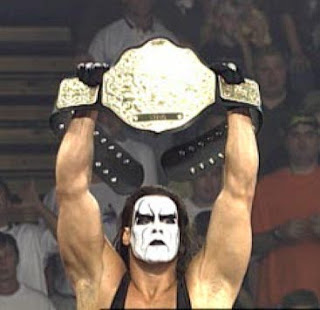 So what happens if Sting comes to the WWE in 2010? A lot of people, even Sting say they feel that he would be buried if he ever decided to take a trip up north to work. Considering who Sting is, this would not happen. Looking at the past at those who did not receive the push they received in WCW, Diamond Dallas Page, Scott Steiner, and Jeff Jarrett, just to name a few, these guys either were too old, or were in WCW in a time in which they were desperate for new stars. Had DDP been in the WWE today, but at a younger age, Im almost certain that he would be a top player in the company. 2001 was just simply the wrong time. Take a look at Chris Jericho and Booker T, while many may feel they were repackaged, they still went on to become World Heavyweight Champions. After all, Vince McMahon even put the title around Goldberg, even allowing him to defeat two of his biggest stars in Triple H and The Rock. Now if Sting comes in 2010, there is no other person for him to square of against then the second biggest Superstar in the history of the company, according to the DVD, The Undertaker. Obviously this match occurs at WrestleMania, and Sting does not win. However, there is an opportunity for Sting to face guys like Cena, Orton, Sheamus, and even Kane. So back to the original point, is Sting an icon? In my opinion, Sting is an icon in professional wrestling. In our world, no matter when you came up as a fan, you know who the following guys are: Hulk Hogan, Shawn Michaels, Bret Hart, The Rock, Stone Cold Steve Austin, Undertaker. There are many more on this list. But to question if he is an icon, one must understand that we are talking as an icon of wrestling and not an icon of entertainment. When it comes to an icon of entertainment, Sting is not one of those guys who people automatically know who you are talking about when you are not talking to a fan of this business. Check out this episode of Perfect Plex Talk Radio by clicking the link below.